See snowflakes dance and candy treats perform for Clara and her prince at “Nutcracker” performances across the Southland. Marat Daukayev School of Ballet’s “Nutcracker” will be at the Luckman Theater, 5151 State University Dr., Sat., Dec. 8 at 2 and 7 p.m. and Sun., Dec. 9 at 11:30 a.m. and 4:30 p.m.
Local children performing in the holiday ballet are Freya and Wolfie Bikel, Yian Choi, Annabel Cury, Emma Daukayev, Ava Eisendrath, Annabelle Johnson, Tabitha Johnson, Stella Josias, Abigail Kampf, Jina Kang, Julia Kang, Fiona Kim, Jasmine Metter, Anabelle Murray, Chloe Murray, Alexandra Park, Tess Seidler, Grace Tankenson, Lorelei Toley, Lola Vernetti, Skylar Whitley, Sorcha Whitley, Ava Winer, Ellis Yeom and Jinny Yoon. Tickets start at $42. See maratdaukayev.com. “George Balanchine’s The Nutcracker” will be performed by the Miami City Ballet at The Music Center’s Ahmanson Theatre, 135 N. Grand Ave., Thurs., Nov. 29 through Sun., Dec. 2. Visit musiccenter.org/nutcracker. Westside School of Ballet’s “The Nutcracker,” considered the longest-running production in Los Angeles history, will be at The Broad Stage at Santa Monica College’s Performing Arts Center, 1310 11th St., Sat., Dec. 1 and Sun., Dec. 2 at 1 and 5 p.m. Visit westsideballet.com. Enjoy the nontraditional “Hot Chocolate Nutcracker” by the Debbie Allen Dance Company at Redondo Beach Performing Arts Center, 1935 Manhattan Beach Blvd., Thurs., Dec. 6 and Fri., Dec. 7 at 7:30 p.m., Sat., Dec. 8 at 1 and 7 p.m. and Sun., Dec. 9 at 2 p.m. Visit thehotchocolatenutcracker.com. The Los Angeles Ballet (LAB) sets “The Nutcracker,” in 1912 Los Angeles at the Dolby Theater, 6801 Hollywood Blvd. are Sat., Dec. 8 at noon and 5 p.m. and Sun., Dec. 9 at noon. Visit losangelesballet.org. 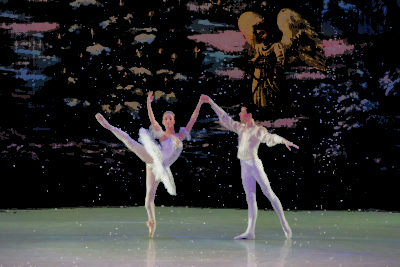 Moscow Ballet’s performance of the “Great Russian Nutcracker” will be at The Wiltern, 3790 Wilshire Blvd., Fri., Dec. 14 at 7 p.m. and Sat., Dec. 15 at 10 and 5 p.m. Visit nutcracker.com. The Long Beach Ballet’s fantastical version of “The Nutcracker,” now in its 36th year, is at Long Beach Terrace Theater, 300 E. Ocean Blvd., Long Beach, Saturdays, Dec. 15 and 22 at 2 and 7:30 p.m., Sundays, Dec. 16 and 23 at 2 p.m. and Fri., Dec. 21 at 7:30 p.m.
Pasadena Dance Theatre’s production at the San Gabriel Mission Playhouse, 320 S. Mission Dr., San Gabriel, is Saturdays, Dec. 15 and 22, Sundays, Dec. 16 and 23 and Fri., Dec. 21. See pasadenadance.org. For something a little offbeat, see “Sugar Plum Fairy” at the Skylight Theater, 1816 1/2 N. Vermont Ave. Shows begin Sat., Dec. 1. The play tells the story of a 12-year-old girl who dreams of dancing the lead in the “The Nutcracker.” Audiences are encouraged to wear Christmas sweaters and Hanukkah hats. Visit skylighttheatre.org. Included before many of the El Capitan showings will be performances by local dance companies, as well as a costume exhibit in the theater. Visit elcapitantheatre.com.